Continuing in April: Artists Local 101 group show, Mark Bernahl's new "Wishes"
(Bend, OR) Thump Coffee welcomes spring with an exhibit of Avis Lofts. Tumalo-based artist and custom furniture designer Robert Johans elevates the humble, utilitarian birdhouse into the fine art realm. 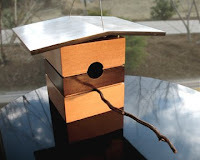 His designs are so sleek, modern and cool it makes one wish for wings simply to be able to live in his Avis Lofts. For Art Hop on Friday, April 4 Thump Coffee will stay open until 9:00 pm, pouring complimentary wine and showcasing the guitar talents of Thump barista James Simmons. Though Simmons took up the instrument himself only a decade ago while in his 20s, music runs deep in his blood. His father Larry played for the Grand Ole Opry and toured with top country musicians, and grandfather Buddy, uncle Don and cousin Dean are all professional musicians. Simmons endlessly explores the possibilities of the guitar fretboard. When asked to describe his music, Simmons simply shrugs. “My friends describe my music as an eclectic mix of finger-style progressions interspersed with bluegrass-style flat picking.” His guitar heroes include father Larry Simmons, and such pioneers as Michael Hedges, Pierre Bensusan, Mike Marshall, Tony Rice, and Scott Huckabay. Mark Bernhahl’s popular “Wishes” installation is hanging again, and customers are encouraged to continue creating wish planks to be rotated into the installation throughout the year. Thump Coffee is located in downtown Bend at 25 NW Minnesota Ave. For details, visit www.ThumpCoffee.com or call 388-0226. Complimentary wine and hors d’oeuvres. Dinner reservations available after 7pm. For reservations and info, visit www.bistrocorlise.com or call 385-6979. Bistro Corlise is located downtown Bend at 916 NW Wall Street. 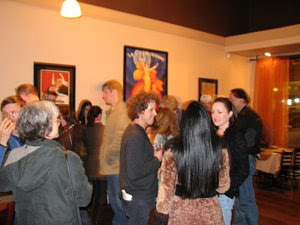 Photo from March Art Walk. (BEND, OR) The Jackalope Grill and WineStyles present a Women’s Wine Dinner on Monday April 7 at 5:30pm. The evening features a special four-course meal paired with wines. Carol DelMonico, a certified life coach, and writer Linden Gross will speak briefly on how to slow down and take time for yourself. Cost is $60 per person. For reservations, please call WineStyles at 389-8889. Seating is limited. For more, visit www.JackalopeGrill.com. The Jackalope Grill is located just off Reed Market road in the Scandia Plaza, 1245 SE Third St. (S. Hwy. 97) in Bend. In an effort to continue to increase communication with citizens of Deschutes County, residents are able to receive County news notices at the same time local media receives them. regularly receive the notices and WILL NOT be sold to any other entity. property and are subject to public record requests. may be sent, please call 330-4640. Founded in Bend, Oregon by Malerie Pratt, who was a teenager when this story began, Vima Lupwa Homes opened its first home for desperately poor orphans in Mikomfwa, Township of Luanshya, Zambian in 2006. The small home provides a safe, loving family atmosphere in which the basic needs of up to 14 children are met, including proper nutritious meals, beds, clothing, education, health care and most importantly – love and nurturing by parents Violet Membe and her husband, Mwala. Cooking classes with the Jackalope Grill’s Chef Timothy Garling have become the hottest culinary ticket in Central Oregon. In January and February Garling sold out every available space in four class sessions. 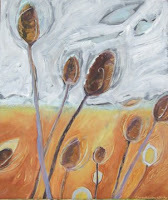 March’s classes, “Sauces II - More Contemporaries and Classics” have now filled, as well. To avoid disappointing food lovers and cooks, the Jackalope has started a waiting list and will offer spots in future classes to those on the list first before opening enrollment to the public. In his classes, Garling teaches a small group how to prepare specific dishes, kitchen and cooking tips and other secrets gained during almost 30 years as a restaurateur and chef. Cooking classes are on Monday nights, starting at 6:00 pm at The Jackalope Grill and are limited to just 10 participants. Cost is $50 person. To reserve a space, call The Jackalope Grill at 541-318-8435. For more details, visit www.JackalopeGrill.com. On Thursday, March 13, watch “Cooking Central Oregon Style” with host Donna Britt on Central Oregon Cable TV channel 11 at 12:30 and 6:30 pm. And Saturday, March 15, tune in to “Cooking With Gusto” with host Julia Gray on KBND News/Talk Radio (1110 AM) at 9:00 am. A limited number of seats are still available for Bistro Corlise’s special food and wine journey through France’s southwest region (the Bearn, the Quercy, the Gers, and the Basque country; areas south of Bordeaux, north of the Pyrenees Mountains, and west of Languedoc). This special five-course meal paired with regional wines and liqueur is Tuesday, March 18. Cost is $125.00 per person. For menu and reservations, please call 385-6979 or visit www.bistrocorlise.com. Bistro Corlise is located downtown Bend at 916 NW Wall Street. photo: David Johnston (left) trains Crooked River Ranch Fire Department Capt. Tim McLaren with Rookie Sidekick fire hose roller. Fire Hose Rollers by Deschutes River Mfg. BEND, Ore. (March 2008) -- Deschutes River Manufacturing’s Rookie Sidekick line of portable motorized fire hose rollers will now be available in New Jersey and Eastern Pennsylvania from Continental Fire and Safety. Based in Trenton, New Jersey, Continental Fire and Safety provides innovative and advanced fire, safety and suppression equipment. 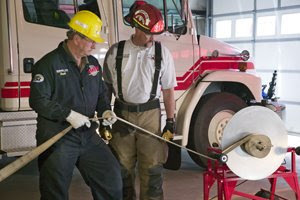 The company also distributes the Rookie Reloader, for transporting and re-decking rolled fire hose. Continental Fire and Safety Inc. In its September/October 2007 issue, Canadian magazine Oil & Gas Product News wrote that the Rookie Sidekick and Reloader system "allows firefighters to effortlessly transport rolled hoses, and it reduces the labour needed to re-load hose back on to the engines." The Rookie SideKick fire hose rollers recently have been purchased by wildland, municipal and industrial customers, including the Valero Refining in NJ and DE; Sunoco in NJ; Matanuska-Susitna Borough Fire Dept. in Palmer Alaska; Bureau of Land Management in Shoshone and Burley, Idaho; Kenai Wildlife Refuge in Soldotna, Alaska; and US Forest Service Columbia River Scenic Gorge in Oregon. The Rookie Sidekick hose rollers and The Rookie Reloader re-decking system are available to put through the paces without obligation to buy through a 30-day trial program. All Sidekick models are equipped with either a Honda gas engine or Baldor electric motor for years of virtually maintenance-free operation. The Rookie products are OHSA-inspected. The original Rookie units are available through the GSA system (GSA orders do not qualify for the 30-day trial). For more information, visit www.the-rookie.com or call 541-480-5967 or 877-868-1951. HOURS: We won't be staying open late for March Art Walk. Join us for an Artists Local 101 reception on Friday, April 4 for the Spring Art Hop. Artist Local 101 is a non-profit organization dedicated to promoting contemporary and outsider art. For many years, the group has provided local artists who work "outside the box" with a vehicle for exhibiting their art, as well as a place to network with other artists. This group show features a diverse representation of many artists affiliated with the organization, including Holly Hutton, Lisa Wachs, Lloyd McMullen and Bridget McGinn. Artist Local 101 welcomes new members, and membership forms will be available at thump. LITERATURE: Buffalo's Column According to Buffalo, his column "was and is mostly to entertain, sometimes to stimulate, and possibly, to make you think. The column will deal with current political situations, socioeconomics, local news, current movies, or anything that comes into the wacky mind of its writer." Pick up the daily installment next time you're in. And check the video about his scuplture work here. There were so many fun entries, we decided to create three categories so more people could win: Written Response, Illustration and Kids. "A Thump is a magical forest gnome full of vim and vigor, from the land of Espressiata who brings joy, jitters and higher functioning beta brain waves to all who consume its magical forest nectar brew." "As a person is wavering in that morning twilight of existence in the last minute while stumbling ahead of the current minute. Reaching for that first shot of coffee. That will land them squarely in the now. "Possibly one of man's few organic means of harnassing the long sought answer to time travel." "An elixir of faith and bravery that always helps you stand up right where you're at - and do the next right thing." "Thump is the feeling you experience when complete happiness is realized. You smile, turn off your headlights and drive home with a chocolate malt to guide your heart, and a full moon to light the path." "Thump: (noun) The slippery, expanding, clicking sensational experience at the bottom of the swallowing of your first decadent warming wake up drink, in downtown Bend, OR." "It's when a great patient all-knowing muse finally cracks through my too-cluttered skull. A gentle insistent Thump. . . Thump. . . Thump. . . Until a triumphant final THUMP! Crashes through, and I, thinking it was by my own effort, give birth to a story." Winners of the Illustration and Kids categories along with runners up will be posted next month. 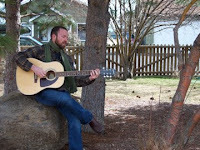 Listen to Kent's apearance on Julia Gray's "Cooking With Gusto" radio show. This is where the sensory adventure begins! Come to our public coffee cuppings and taste coffees side by side. Discover personal preferences, likes and dislikes, and begin to taste hints of citrus, fruits, wines, chocolate, spices and possibly flowers. You will appreciate how a skilled roaster took meticulous time and care to bring those flavors out instead of roast them away (see this month's Thumpology). Cuppings are usually the third Sunday of the month at 1:30pm - get details at our website and by subscribing to this newsletter. The Stumptown-El Injerto relationship is one of our proudest relationships. It's our longest standing Direct Trade coffee and we feel like our efforts, combined with that of the Aguirre family, have improved the coffee year after year. Unfortunately, that's not enough for us. We need more El Injerto! Last year we brought you folks the Maragogype varietal for the first time and it sold quicker than a hoppy IPA at our ritual Friday 'Mandatory Meetings'. This year, we brought in another El Injerto varietal family member: the Pacamara. The Pacamara is a hybrid varietal, created in El Salvador, from the Maragogype and Pacas varietals. Pacas is a mutation of the Bourbon. If the Marago is the young, punk rock brother, the Pacamara is his classy older sister. She's bright but refined. She's past-punk and delves into the darker toned underground. Finca El Injerto's Pacamara varietal beautifully balances a delicate savory flavor with milk chocolate, orange pekoe tea, orange blossoms and violets. For those of you who loved hanging out at A Cup of Magic, you may remember seeing Emily working there (she's also lived in Central Oregon for 15 years and attended middle school and high school in Bend). The Cup was where Emily made her barista debut, and we're so thrilled that she brings a little bit of its magic to Thump! Emily, like many of our thumpistas, juggles job(s), interests and school. In Emily's case, she is attending school as the teacher, not the student. She works for the Bend-LaPine Schools in a job share as a 4th grade teacher. She also enjoys practicing yoga, discussing good books, knitting cool hats and scarves, and traveling when time permits. Thumpology: What's the Big Deal About the Roast? Part I: How the Roast Affects Flavor Before we knew much about coffee, we'd buy black beans glistening with oil, with descriptions like, dark roast, smoky, robust flavor. This sounded pretty good because, who wants to drink a whimpy cup, right? If dark roast meant robust flavor, then it would stand to reason that a medium roast or light roast must somehow be less flavorful. Once we started learning how to roast and cup coffee however, we learned that nothing could be farther from the truth! Simplistic comparisons have been made between roasting coffee and barbequing meat, in terms of how one's "cooking technique" ultimately affects flavor development. In both cases, there's a search for the perfect time/temperature relationship to create a wonderful end result. Add too much heat and/or time and the end product tastes like any burnt barbequed meat or burnt roasted coffee, instead of like the sought-after savory cut or the deliciously complex cup of coffee. Coffees from around the world contain unique flavors trapped inside them, and it's the roaster's job to coax them out through the roasting process. If he or she is not paying close attention to the beans throughout the roasting process, making adjustments as needed to the heat and time, then certain flavors will not develop or will possibly be roasted out of the bean. Knowing that there are many factors such as density, size, age, and moisture content that affect how a bean roasts, a roaster will roast several batches and cup each batch to determine how to best roast each type of coffee. Come to our public coffee cuppings, and you'll be able to taste coffees side by side. (Cuppings are usually the third Sunday of the month at 1:30pm - get details at our website and in this newsletter.) This is where the sensory adventure begins! You will discover personal preferences, likes and dislikes, and you will begin to taste hints of citrus, fruits, wines, chocolate, spices and possibly flowers. Then, you will truly appreciate how a skilled roaster took meticulous time and care to bring those flavors out instead of roast them away. You will also notice that all of our beans are brown and oil free, not black and shiny, an indicator that the coffee was carefully roasted to bring out its individual flavor profile. Listen to Kent's interview on Julia Gray's "Cooking With Gusto" radio show. Organic Green Jasmine Tea - Sweet & soothing. Green tea scented with real jasmine blossoms. Think of jasmine pearls letting loose! Organic Ginger Herbal Infusion - Sip up the zing! Steeped from chunks of dried ginger root. Perfect for fighting a cold or clearing your mind. Organic Yerba Mate - Bursting with antioxidants, this stimulating drink will brighten your spirits! (BEND, OR) Bistro Corlise will host an Open House & Tasting with complimentary wine and hors d'oeuvres for First Friday, March 7, 5:00-8:00pm. The restaurant will be closed for dining, but the bar will be open. For more, please call 385-6979 or visit www.BistroCorlise.com. Bistro Corlise French restaurant is located downtown Bend at 916 NW Wall Street. (BEND, OR) The Jackalope Grill’s Chef Timothy Garling and Anam Cara Cellars present an “Almost St. Patrick’s Day” winemakers dinner on Sunday, March 9. Starting at 6:00 pm, a special four-course menu will be served with wines selected and introduced by Anam Cara Cellars owners Nick and Sheila Nicholas. According to Chef Garling, Anam Cara Cellars “represents a real find.” The winery has been tipped as a "Rising Star" among Oregon Pinot Noir producers by Decanter Magazine. And its 2005 Nicholas Estate Pinot Noir was given four stars by British writer Linda Murphy in her “Oregon Pinot Noir Grows Up,” Decanter article. The Anam Cara Cellars Winemakers Dinner Menu features a first course of Seared Sea Scallop with spicy cole slaw, shitake mushroom and Anam Cara 2007 Estate Riesling. For the second course, an Oregon Seafood Louis of fresh Oregon dungeness crab and pink shrimp is accompanied by Anam Cara 2007 Estate Riesling. Third up are Medallions of American Bison in a Pinot Noir reduction sauce with truffled potato puree and smoked baby golden beets paired with Anam Cara 2005 Reserve Pinot Noir. And to finish, Pain Perdu with Oregon Pear Compote with house-made brioche, hazelnut-caramel sauce and roasted cranberries with Anam Cara 2007 Late Harvest Gewürztraminer. Commenting on January’s winemakers dinner, Mike Eyres of Chehalem said, "As a winemaker, I spend months creating complex, structured, intensely fruited wines, and I sincerely appreciated the thought and care Tim put into developing such an exceptional, well-crafted menu with great food/wine pairings. It truly is an art to match wines with food well. The result was one of the most memorable winemaker dinners I've attended -- a great group, impeccable service, and a truly enjoyable evening." This event begins at 6:00. Cost is $85 (includes gratuity). Space is limited. Please make a reservation today by calling The Jackalope Grill at 318-8435. For more, visit www.JackalopeGrill.com. 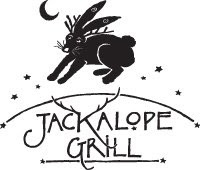 The Jackalope Grill is located just off Reed Market road in the Scandia Plaza, 1245 SE Third St. (S. Hwy. 97) in Bend.